Few things are more frustrating for a hitter than to unleash a sweet swing, make contact with the ball, then have ball pop up weakly somewhere in the infield. This can be especially frustrating for a slow-pitch softball player, since the ball gently glides by, ripe for the picking. 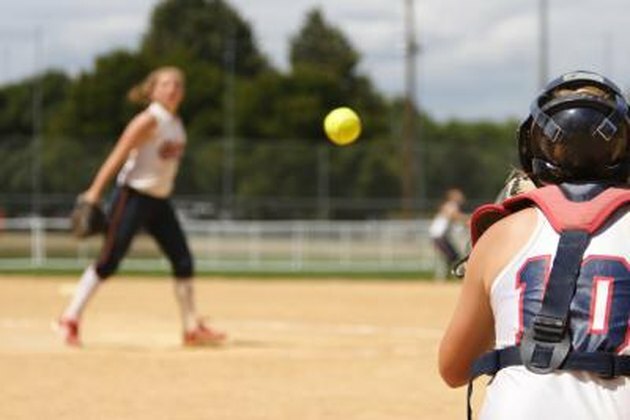 Usually, if you’re consistently popping up in slow-pitch softball, that sweet swing, along with your timing, needs some adjustment, but just making contact is incredibly important. Popping up while swinging at a large ball that moves slowly may be caused by several issues. Your swing may be making contact with the wrong part of the ball, meaning you aren’t “squaring up” on the ball correctly. Your timing may be off and you’re swinging too early or too late. You may not be following through on your swing, robbing power and causing it to lazily hang in the air after you make contact. Your grip may also be too low. The key to reducing your pop-ups is to adjust your mechanics so that you hit squarely and drive through the ball. Adjust your grip so that you “choke up” on the bat. This gives you more control, allowing you to more easily and consistently place the sweet spot of the bat -- the meaty part of the barrel -- directly on the center line of the softball. If you usually place your hands on the end of the handle and around the knob, your pop-ups are likely a result of not making square contact with the ball. Don’t choke up too much on the bat, as this will rob power from your swing. Practice with different grip placement until you find the happy medium that best suits you. Stand with your feet at about shoulder width and avoid “tensing up.” Relax and avoid extraneous swings in preparation for the pitch. Keep your back and legs in line so you don’t lean forward and backward. Stand with your feet 6 to 12 inches away from the side of the plate. Standing too far away from the plate will force you to extend too far out to make contact, which can hamper your accuracy and prevent you from swinging through the ball. In one fluid motion, drive down into the ground with your back foot, rotate your hips and swing the bat as the ball drops to about chest level. As the swing crosses the middle of your body, plant your lead foot into the ground as you make contact with the ball. Keep your eyes focused on the exact spot you want to make contact with with a slight uppercut motion of the bat. Once you make contact, keep swinging. Follow through all the way until the bat comes to your lead shoulder.